Talking about native grapes of Italy is probably one of my favourite things to do! For this month’s #ItalianFWT, we travel to Umbria, Italy’s only landlocked region. it doesn’t need water to make it great though! One of the few Trebbiani of importance lives here – Trebbiano Spoletino, then there is the grapes of Orvieto; and then the big boy – Sagrantino. The home for this grape is Montefalco, located between Perugia and Spoleto in Umbria. Traditionally, the grapes were dried to produce sweet wines, but today made into a dry, tannic beast, yet the tannins are lively, smooth and polished. It is one of three highly tannic grapes in all of Italy. In fact, one could argue it is the most tannic of any Italian grape. Pignolo, from Friuli Venezia-Giulia is an up and coming tannic red grape from a region where white grapes rule, and Lagrein from Alto Adige is bold and tannic, but with dark fruit berry nuances, the tannins don’t seem as noticeable. Sagrantino on the other hand, takes at least 10 years to settle down, meaning you don’t want to drink these wines young! These wines were traditionally called Sagrantino Montefalco, but recently the named changed to the reverse: Montefalco Sagrantino to highlight the DOCG area of Montefalco in Umbria. Giampaolo Tabarrini comes from four generations of a family run winery. Because each bottle bears his name, he is committed to only wines of outstanding quality. The family has 17.8 hectares under vine and they produce 77,000 bottles of Sagrantino each year. Tabarrini is the only Umbrian winery to produce, age and bottle three different vineyards of sagrantino separately. And because the grape is so highly tannic, they keep them around for awhile before release: three years in large casks, then an additional 18 months in bottle to settle down before heading off to market. Make no mistake though, these wines are expensive as the quality producers are few and far between. Tabarrini sells for around CAD $59. 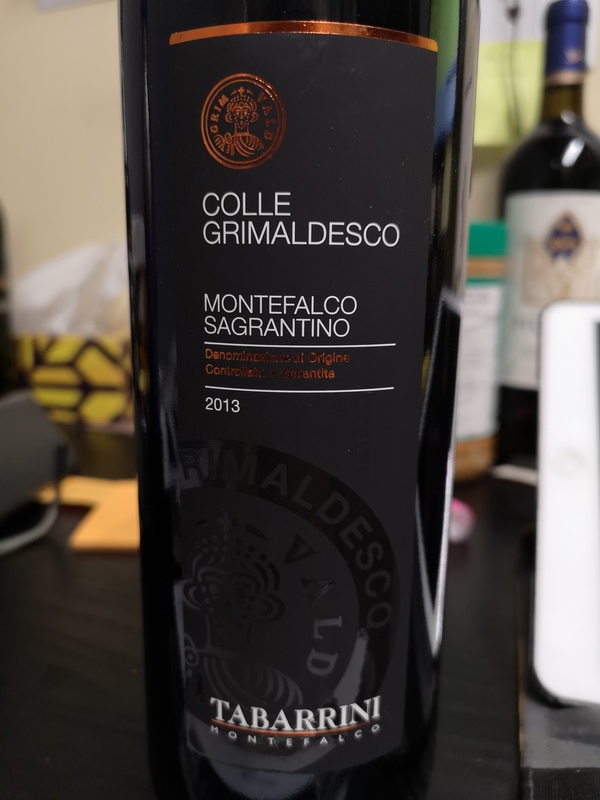 The 2013 Colle Grimalsdesco Montefalco Sagrantino is one of the three (single vineyards) that I happen to have myself here at the store. I decided to experiment with this wine before trying with food to open it and taste over a period of 3-4 days. I first opened this wine on Tuesday and found aromas of mulberry, plum, smoke and ash with more of the same on the palate along with the addition of sage, huge minerality and chalky, robust tannins that coated my teeth, my cheeks and the roof of my mouth! Finished clean with a lasting flavour. Friday…sagrantino just goes on forever! Time to add the food! I’m a sucker for a great burger and barbecuing in -20C would normally be a deterrent, but a little weather was not going to stop me and besides, I already told our friends who joined us, that it was happening! In my humble opinion, I make a mean beef burger, and when loaded with guacamole bacon, sauteed onions and mushrooms, fresh pickles and cilantro, it’s a force to be reckoned with. Add a side of fries and arugula salad and you’ve got a meal fit for a king! Slide over a glass of sagrantino and the meal is complete! Want to learn more about Umbria and Sagrantino? Check out my colleagues blog posts on the topic and fine your powerful wine! Susannah Gold from Avvinare shares something good…. Mmm…sagrantino. If you get the chance to find one, be prepared to nurse it over a few days as I did. want something more easily quaffable now? Try the Montefalco Rosso – with only 15% sagrantino, it’s calmed down considerably and a freshness and juiciness is brought to the blend with the bulk of the rosso having sangiovese in it. Salute! This entry was posted in Education, Joy of Wine, Varietals, wine and tagged #FWT, autochthonous, bold, DOCG, food, grape, Italy, landlocked, Montefalco, native, pairing, region, Sagrantino, travel, Umbria, wine. Bookmark the permalink. Sagrantino goes on forever! I love it! Love Sagrantino and your food matching experiement was so much fun! Great intro to this producer and I could totally see it opening up over a couple of days. Interesting to compare it to Lagrein though – while structured, the Lagreins I’ve had have never been so overwhelmingly tannic on this level. That is correct. All to say that although Sagrantino is THE most tannic grape, Lagrein and pignolo are right up there with it! Great advice to enjoy Sagrantino over a period of days. Mine also opened up, although I couldn’t resist finishing it on day 2. Luckily I have another couple of bottles! Thanks for the Tabarrini introduction. Seems they’re very committed to the grape with the three vineyard designated versions. Wouldn’t it be fun to do a tasting comparison of the three?!? Yes, absolutely! I need to check with my rep to see if she has access to the other two! Now I’m anxious to open the Lagrein I have around! Thanks for all the info! I really enjoy Lagrein…because it has this beautiful dark fruit, it doesn’t seem so tannic. I also carry a Lagrein rose! Super unique and I’m sitting on a 2015 or 16 I believe, but I’m not worried! Ageable rose is not very common! Definitely a hand sell wine though! Cheers! Wow! It would be a great tasting experiment to pour each of the single vineyard offerings alongside one another and compare. I’d love to visit your store one day. Cheers!